Home›Economic Development›Lock it up. But where? DETROIT—If you ride a bike in Detroit, you have likely noticed the patchwork of bike parking throughout the city: not enough bike parking where it’s needed; non-functional bike racks in many areas where it does exist; bikes chained to fences, lampposts, and parking meters. Then there are the gems: the businesses that let cyclists bring their bikes inside to avoid theft; the neighborhoods like Corktown and Southwest with consistent and themed bike racks (thanks to the Corktown Residents’ Council and Southwest Detroit Greenlink). So, what does it take to get bike parking in this city anyway? And can we get some more of it, please? Earlier this summer, after locking up my bike in front of a Midtown business, I asked the owner who was responsible for the two bike racks out front. Since the business’ building is leased through Wayne State University, the owner contacted the leasing office for permission, and the office directed her to the City. The City told her to seek permission from WSU. Her solution to the mixed-messages? She enlisted the help of Wheelhouse Detroit Bike Shop to pick a design and order the racks for several hundred dollars, and had them installed herself. She also preferred to remain anonymous. Ian Studders serves as property manager for WSU. He says if bike parking is in the public right of way, or next to their property versus on their property, the University and its tenants have to consult the City. “We could probably do more [to support bike parking], but in general, we’re doing things on campus that are pro-biking and respect bikes as a mode of transportation,” says Studders. He confirmed he had no contact at the City to whom he refers people. Since opening in 2008, Wheelhouse Detroit has helped install nearly 10 bike racks in and around Detroit. They place orders through a wholesale catalog with a wide range of rack styles, and have received so many inquiries regarding appropriate bike parking, they started a blog about it in 2010. Kelli Kavanaugh, co-owner at Wheelhouse, said there is a process in place to get City permission to install bike racks, though people often avoid it or find it too slow, eventually taking matters into their own hands. She said to write a letter addressed to Honorable City Council; explain who, what, where, when, and why; include an address, phone number, and a diagram of the proposed rack and location; and mail, fax, or e-mail the letter to her at the City Clerks Office. After submission, Ford said the appropriate department will review the submission (i.e. the Department of Public Works City Engineering), then hand it over to City Council (which meets every Tuesday), then refer the petition to committee for a vote (i.e. Public Health and Safety), and finally come back the following Tuesday for a whole Council vote. If passed, the Mayor will sign off on the petition seven to 10 days later. Ford said that with Kevin Orr as the Emergency Manger, the number of days before he will sign off on petitions is unknown. While a City permit process exists for off-street parking, on-street parking is a different story. Jerry Belanger, owner at Park Bar at Elizabeth and Park Streets, has experienced challenges working with the City to allow his on-street bike rack. Four years ago, Belanger designed and built a rack to accommodate 16 bikes in a 9-foot space—the size of a compact car. He estimates it cost him roughly $1,500 in materials and labor. Last winter, Belanger was requested by a City Inspector to take the rack down (Note: At the time of this request, there were about ten bikes locked to the rack). The rack was disassembled and put into storage this past March. Since then, the spot has become a metered parking space. It’s not all bad news—Belanger has had a lot of support from some city officials. He says the reason he was able to have the rack in operation for as long as he did was in part due to support from a city engineer that has since left office. He has also had local police defend his bike rack when other officers from outside of the area requested he take it down. Had he refused to take the rack down, Belanger isn’t sure what would have happened. He imagines the City would have dismantled it and taken it away; perhaps also fined him. He preferred not to find out the hard way, but wishes there was a straightforward process for obtaining and installing on-street racks/corrals that other businesses could easily replicate. Another self-proclaimed bike-friendly business is Cass Café in Midtown. Owner Chuck Roy described how several years ago, Midtown Detroit, Inc. offered him a free wave-style bike rack. When patio construction began this summer, Roy uninstalled the rack and began plans for a new one. Roy commissioned local artist, Bob Sestock, to design a more modern rack for the south side of the building. It accommodates at least six bicycles, three of which are elevated on rubberized arms. Though Roy preferred not to disclose the cost of the rack design and installation, he said half of the cost will be covered by a façade improvement grant from Midtown Detroit, Inc.
“The number one thing I would tell other employers is that it’s [biking] the way of the future, so get on board and offer bike racks,” says Roy. He says that since first moving into the space, there are a lot more young residents in the area and biking has really taken off. “Younger generations are more willing to put their money where their mouth is when it comes to energy conservation and fighting global warming,” according to Roy. Roy did not go through any permitting processes with the City for the bike racks, though he did for the patio railing and pavement. He considers the bike rack an element that falls within his business’ artistic license, much like the chairs he uses or music he plays inside. A growing number of organizations are starting to plan for bike parking as well. Take the case of the Isaac Agree Downtown Synagogue at the intersection of Griswold and Clifford Streets. After a major fundraising campaign this past April, the Synagogue Board decided to invest in bike parking, and sent a letter to the City’s Department of Public Works in May describing plans to install either a sidewalk rack or an on-street corral. In the interest of time, the Board opted to create a mobile sidewalk rack and solicited design suggestions from frequent cyclists. Local metal maker, Billy West, created the rack for roughly $1,000. Jon Koller noted that installation by a contracted firm might cost only $100-200, though most firms would unlikely complete a project without a permit. 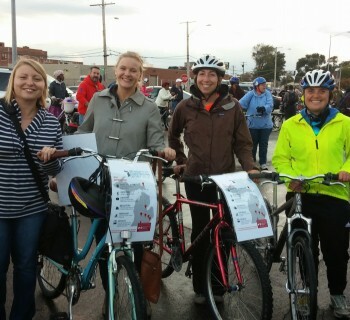 Eastern Market Corporation will also be installing two bike-parking areas as part of the Link Detroit! project to be completed by November 2014. Bike racks will be located near the main office building at Russell and Wilkins, and Lot 1 adjacent to Shed 2. 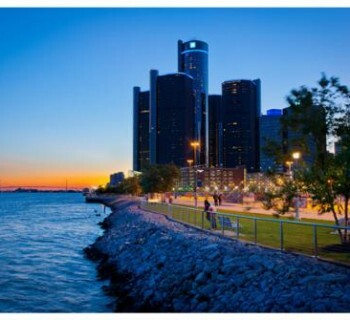 Funding for that project comes from a federal Department of Transportation’s Transportation Investment Generating Economic Recovery (TIGER) grant, applied for by the City of Detroit’s Department of Public Works. She also suggests avoiding comb-style racks, as they only let you lock a front tire, which can be most easily removed. Wave-racks should also be avoided since they offer a very limited capacity, and just one incorrectly parked bike can prohibit other bikes from parking there. 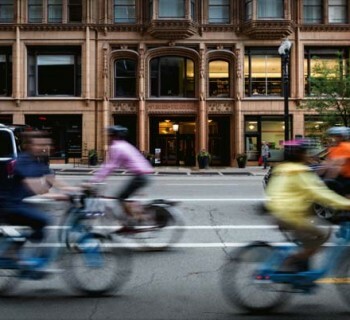 Want to see Detroit's biking infrastructure blossom? Attend a panel discussion this Tursday!